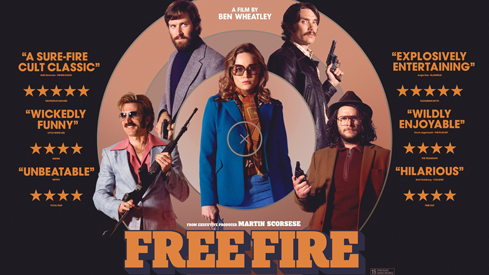 I’ve been eagerly anticipating the release of Ben Wheatley’s shoot ‘em up ‘Free Fire’ since I spent four days on the set as a production assistant in 2015. With its recent theatrical release, it has met its high expectation being called an instant classic by people all over social media. Mark Kermode made it his film of the week, and I’ve seen it twice (even better the second time around). It is a cinematic experience like no other, and where better to make such a thrilling ride other than Brighton. After doing a Q&A tour with advanced screenings of the film across the country, Ben Wheatley returned to his hometown Brighton to round off the trip at his ‘favourite cinema in the country’ Duke Of Yorks. When Wheatley introduced the film, he told us that it would be a fast 90 minutes, and that’s exactly what it was. 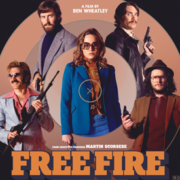 Free Fire keeps you entertained from start to finish; and with its comedic dialogue and explosive action it’s hard not to enjoy yourself. The audience at Duke Of Yorks welcomed Wheatley back with huge applause and the first question was of course, about Brighton. Wheatley is from and still lives in Brighton, so it’s not hard to imagine why he might want to shoot a film here. However, we were all amused when he said it was because he liked the idea of walking to work everyday. According to Wheatley the production was great fun, and Brighton was a huge part of that. He was able to take the cast and crew, who were new to Brighton, to different restaurants and bars even he had never been to before; soaking up the city’s atmosphere together and making the most of the seven weeks they had here. This would explain why the cast look like they’re having so much fun in the film, because they genuinely were enjoying each others company and having a good time on and off set. I worked the last four days on the set, and still had an incredible experience. Most of the cast had already wrapped, but what I was able to see was how close the entire crew had become and ho w much everyone had enjoyed the production. Martin Scorsese’s name being bought up in the Q&A’s is probable something Wheatley is used too, being attached to the project as executive producer, it was bound to be mentioned. But if you thought that the director of Taxi Driver was walking around Brighton, you would be mistaken. Instead Scorsese gave his name after reading the script. Something that helped ‘legitimise’ the project according to Wheatley, which helped cast and fund the film. Ben Wheatley has quickly become one of the UK’s most prolific and exciting directors. With recent films such as Sightseers, High Rise and now Free Fire, the film industry will want to see him continue this fantastic run of entertainment. This means he is more than likely to make films in Brighton again and with the cast and crew having so much fun during the production of the film, word is sure to get out that Brighton is the perfect city for film.